The last time I drove a car in the CityCar category was way back in the early 90s where I used to borrow my army buddy's Fiat Uno to go give tuition whenever he is stuck in camp on guard duty. Like the name Uno, this was ONE fun car to drive for ONE person as I remember vividly the car almost couldn't make it when I took in an extra passenger. Ok ok... so I exaggerate. Then as we grew up, we kinda got caught by the undercurrents of keeping up with the Jones' as we wanted faster, bigger and flashier cars. Well, the good news is that I have gotten past that phase and really focus on what's really important. That is getting from Point A to Point B in a safe, comfortable and economically sensible fashion. 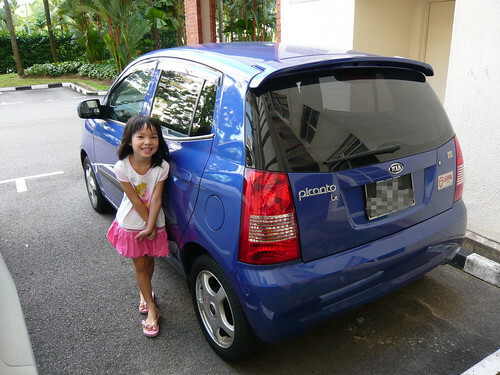 Hence, the car in today's review is the modest Kia Picanto LX. It's just happened one day a few weeks ago when I was chatting with Vandalin on MSN and I was touching on the topic of how I used to rent cars whenever I am back in Singapore. I told him about Falco-Air which has all along gave me the best deal but I lamented at the fact that I have to go all the way to Sin Ming just to pick it up and then returned it the day before. I also added how nice it would to be like in the US, where you can just drive off from the airport and dropping it off at the airport too upon return. Yes, granted that there are such services at the Singapore Changi Airport but they are the "branded" rental companies like Hertz and Budget that would you cost you an arm, a leg and some say kidney as most, if not all of their clientele that utilised this services are on Ah Gong Account i.e. the company picks up the tab. Van The Man must have been God-sent when he offered not only to match Falcon-Air's rate but to also throw in the airport pickup/return for a nominal surcharge. So come two weeks before my return, I reconfirm my interest with Van The Man who referred me to the lovely chiobu colleague Sheree who is the person in charge of the car rental services. Instead of the category of Nissan Sunny or Proton Wira (stop sniggering!) which was my default category at Falcon-Air, Vandalin asked if it's ok for me to go a notch down to that of a Kia Picanto. Sure. Why not? That's another 10% off. Good deal! So I landed and took delivery of the car only to realise my big luggage (full of stuff and gifts that belonged to everyone but me. Grrr.....) couldn't fit into the boot, to which Sheree kept apologising. I was amused as I found my situation more comedic than tragic. Oh well, it's just a minor glitch and not something that cannot be resolved as I lugged (no pun intended) the luggage into the back seat et voila! Problem solved. A quick set up of the GPS on my phone (I remembered to download the maps via PC in advance this time) and it's off I go. This car is everything that the Mercedes Benz S65 AMG isn't. There is no power, no space and no speed. There were some things that made it up for every short coming. It is a pretty fun car to drive. It was easier on the wallet as far as fuel consumption is concerned. It was damn easy to park due to the small size. Faith loved it. She always insisted on riding with me up the car park after we dropped everybody off at the cul-de-sac below, just so that she can have an extra minute or two in the car. The crunch test came on the Saturday where I was to drive everybody to go swimming. So in that tiny car, we have my mom which was hitching a ride, the wife, the maid, two kids and a stroller. It was almost like the circus firetruck with 25 midget clowns squeezing inside. I wondered if the car can move after the doors are closed. Wait, can we even close the doors? Fortunately, the answer is Yes and Yes. The car chugged admirably along CTE towards Holland Road without even a sign of struggle. The following Monday was the same passenger configuration and I was at Ngee Ann City faced with a uphill climb to the 6th floor carpark. The slope was steep and again we were fully loaded. A gripe that I have is perhaps the thin shell of the car which made it very noisy on the roads at higher speeds. Very much like the Mazda6 that I rented when I was in Los Angeles back in Oct 2006. In any case, driving a supermini citycar does has its risk as far as safety is concerned but I supposed a vigilant safe driving habit will help you go a long way. Also with a 1.0L engine, it's hard to go over the speed limit even if I wanted to. Also, leave the car at home if you are going to be drinking. Afternote: Yes, it wasn't a fancy car but I am very happy with the rental especially, since I also made a good friend in the process. So, if there is anyone who is interested in car rental services, drop me a line. I'd be happy to make a referral. I'm not too sure abt the Kia Picanto but I've drove someone's Hyundai Getz & it's +/- around the same. Personally I have an inherent bias (courtesy of the getz) towards these small hatchback cars cos.... 1) jin small. the last i drove the getz, my knee was literally clamping the shaft behind the steering wheel. 2) as u mention, the power... not that i speed, but sometimes it's needed to do lane change but the acceleration comes in slowly...(especially in auto cars) 3) limited seating space... -=> i pity the 5th person if he/she's not a kid. CowGoesMoo: Perhaps you are right about bias for I too have one. I guess as a result of no longer having a car in Singapore, the availability of a car in Singapore is a case of no fish prawn also good. As for the need to accelerate during lane change on the highway, there is always the option to flip down to manual 2nd gear to achieve the desired pick up. I like small cars cos i think they are easier to park.. but oh well, let me get my license first.. still debating.. Driving in Singapore is scary..
Chocolate Gal: Regardless of whether one owns a car, I think driving is one of life's essential skills to pick up. This is just so timely! And well, I share the same name as your daughter too....interesting. I've been looking around to rent a car when I head back in Aug for a week or so. Maybe will try the Picanto. 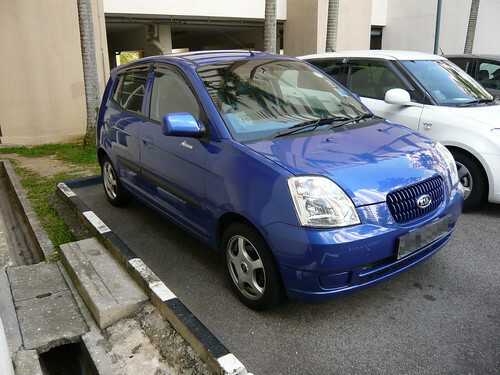 I had a Hyundai Getz when we were living in Spore. Loved the car to bits. Almost shed a tear when we sold the car. Faith: They have a small fleet of about 8 to 9 cars. So do give them 2 weeks lead time, if you are interested. Let me know. RN: From Sheree too? Wait you are referring to the same car with the awful Liverpool FC sticker right? hurhur. woot.. i certainly don't mind renting it if its economical enough.. heh. CowGoesMoo: Not I say Aloe until like that. Is I say the Picanto until like that. Got difference, you know? Vienne: Compared with all the rental companies that I have experienced, they give a good deal but of course there will always be that one other company that would be even cheaper. Customer service level is also another intangible though just as critical factor which I am perfectly happy with this one. Drop me a line if you need me to link you guys up. The Picanto is currently the new family car, and this being the first car that I'm driving around in is pure bliss man. It's so easy to maneuver and park cos it's so small. I'm loving it to bits! I tried driving an 8seater last night, and had to take note to make extra wide turns. I was super afraid I'd scratch the car loh!